Deanestor, one of the UK’s leading contract furniture specialists, has announced its expansion into kitchens for the premium build-to-rent and market sale housing sectors. Following its success in the manufacture and installation of high-quality kitchen furniture across a range of sectors for the last two decades, Deanestor has launched a new service to provide bespoke contemporary kitchens to developers and main contractors for studio and apartment projects for both rent and market sale. The private rented sector (PRS) has grown significantly in recent years as a result of changing demographics, a more mobile workforce, and housing supply at a 100-year low. It is estimated that 20 per cent of the population will be renting within the next five years and around 22 million people will be renting privately in the UK by 2025. Deanestor has been awarded contracts for the supply of PRS kitchens which include a project worth in excess of £4m to manufacture and install around 700 kitchens for a private residential scheme in central Manchester and 700 studio kitchens in Canary Wharf. Deanestor’s highly robust, preassembled carcase solutions use design principles originally developed for healthcare projects. Strong glue and dowel constructions and 18mm carcase materials offer longevity and quality that is far superior to flat-packed kitchen options. The kitchen designs are contemporary with gloss or matt vinyl or laminate finishes, quality soft close hinges and drawer runners, integrated appliances, and high-end work tops in materials such as granite, quartz and Corian. Deanestor kitchens are manufactured in the UK which allows a highly responsive approach, that is particularly critical at the design stages of major projects. 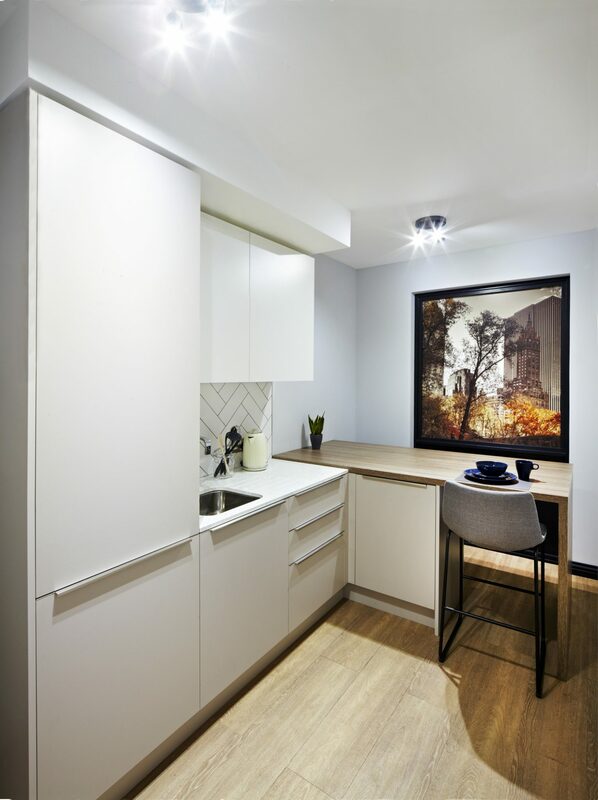 White goods, appliances, sinks and taps are also procured and installed ready for M&E connections as part of the kitchen package for a full turnkey service – whether for studio kitchenettes, kitchens or larger cluster kitchens. Deanestor’s team of experienced project managers ensure large and complex developments are fully supported throughout, for even greater assurance of completion on time and on budget and with minimal contractor supervision required. Deanestor provides high quality contract furniture solutions to construction clients and contractors for healthcare, education, student accommodation, build-to-rent and laboratory schemes. It offers bespoke design services to meet specific project requirements and is responsible for installation to provide a seamless approach for its customers and a single point of contact. For further information, visit www.deanestor.co.uk/kitchens, call 01623 420041 or email [email protected] .